I was recently sent the Theraline Original Maternity and Nursing Pillow and I literally couldn't wait for it to arrive so I could try it out! I remember using a pregnancy pillow religiously in my last pregnancy and I found it really helped. Up until recently, I had been using my old maternity pillow up which we had kept in the loft, however it's over four years old and it has definitely seen better days! I wish I had invested in a better quality one last time, such as the Theraline one, as you can really tell the difference in quality between the two. The Theraline pillow is filled with micro-beads which conforms to your body shape, making it really easy to get comfortable. It is actually really light and flexible too, making it easy to manoeuvre in the night to get in a comfortable position. The pillow can also be used after pregnancy and is perfect to use when feeding your baby, or even just lounging around the house. My three year old claims the pillow when she's watching her tablet. I chose the pillow in grey and I'm so pleased with it, plus it's made from a really soft jersey cotton material too. The cover is removable; making it easy for washing. It can be washed at up to 60 degrees and is suitable for tumble drying. Additional covers can also be purchased separately, which I think is really useful - especially if it's used when feeding your baby and there are any accidents! The pillow offers a great level of support for your tummy, back and belly and is perfect in the later months of pregnancy when you are restless and uncomfortable. I know I will get plenty of use over the coming months as my bump grows. However I have already noticed a difference in how well I sleep since using it. I really wouldn't be without it now! 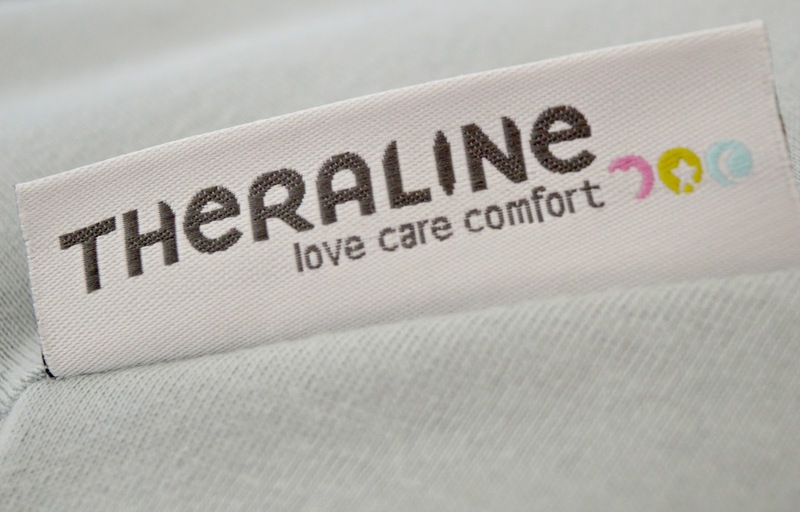 The Theraline Original Maternity and Nursing Pillow retails at £44.95 and can be purchased directly from Theraline, along with a number of other retailers, including John Lewis, Amazon and Mothercare, just to name a few. I would definitely recommend the Theraline pillow if you are looking for a good quality pillow. You can also find out more information over on the Theraline website. Did you use a maternity pillow during your pregnancy? I had this one when I was pregnant with Blake its so comfy. Have it in storage now in case we have another child. Are u planning to use it as a feeding pillow too? It looks so comfy and versatile. I remember using an ordinary pillow to support my bump when I was pregnant and couldn't sleep but if there is ever a baby number three I'd go for this! I never had a maternity pillow but I think I was missing out big time! I had one. I actually won it through a blogger giveaway. I wasn't even pregnant but a couple of months later I fell pregnant. I say it was a 'sign' haha. It was blue too! I used it through my pregnancy, my partner also took it too haha. I love it! Never had a nursing pillow during my pregnancies. I just used a pillow.